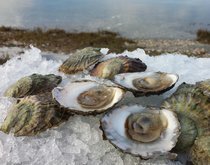 “We are delighted to marshal our unique resources at one of the finest shellfish grounds in the world to bring this special oyster back to market,” said Nick Jones, owner of Jones Family Farms. “Once widely cultivated in Washington state, European flats are now almost extinct here. They have not been available for the better of four years due to state regulations on flat seed. For the time being, flats may only be grown in the same bay in which their seed is produced and JFF has the only facility that can do so”, Jones added.